In a lecture yesterday about the intellectual response to the Nazi occupation of France, former New York Times correspondent Alan Riding said that French cinema, art, and literature thrived despite the occupation. Riding promoted his new book, called “And the Show Went On: Cultural Life in Nazi-Occupied Paris,” before a crowd of academics, Cambridge residents, and students at the Barker Center. He described the responses of French intellectuals during the occupation, ranging from acceptance of the occupiers to risky work with resistance movements. In a panel discussion with Harvard scholars, Government Professor Stanley H. Hoffmann—who lived in France during the occupation—defended French intellectuals who associated with Germans at the time, cautioning skeptics “not to generalize” about the collaborator’s motives. Hoffmann said that not all French people were fully informed throughout the occupation, and that public reception of the Germans fluctuated from acceptance to contempt. “It is very easy to take an uppity attitude,” Hoffmann said, referring to academic reception of French intellectuals during the occupation. In turn, Riding’s work demonstrates “large levels of understanding and modesty,” Hoffmann added. Professor of French History Patrice L.R. Higonnet ’58 agreed with Riding’s approach of using French intellectuals as a lens to analyze a broader French response to the occupation. “[This book is] an excellent picture of the city of light during those dark years,” Higonnet said. Riding said that he took a journalistic approach to writing his historical account. He conducted over 100 interviews and “went around looking for everyone over 90” to consult about their experiences during the occupation, he said. “He combined serious historical research with his journalistic training, which adds a whole lot of interesting dimensions.” said Susan R. Suleiman, professor of the civilization of France. Homi K. Bhabha, director of the Humanities Center at Harvard, praised Riding’s impartiality: “The great strength of the book was that you told it like it was,” he said to Riding. Inez K. Hedges ’68, founder of the Program in Cinema Studies at Northeastern University who teaches a class about French cinema of the period, said that the panel discussion gave her a “whole new perspective” on the subject. Many Americans have long considered Israel a strong ally and have turned a blind eye to its military occupation, focusing instead on the nominally democratic and liberal Zionism that seemed to characterize Israel proper. 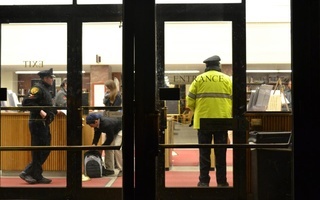 Echoing the spirit of solidarity, about 20 members of the Occupy Harvard movement exited Lamont Library together as a group at 10 p.m. on Friday. 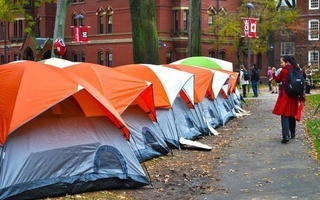 To those who think that this revolutionary movement will duck its head and go away, think again—Occupy is here to stay. On March 6, 1971, about 150 women occupied 888 Memorial Drive, a Graduate School of Design building that was mostly abandoned and about to be destroyed.